The only purpose of a nuclear power plant is to produce electricity. To produce electricity, a power plant needs a source of heat to boil water which becomes steam. The steam then turns a turbine, the turbine turns an electrical generator, and the generator produces electricity. In fossil fuel plants the source of heat is burning coal, oil, or gas. In a nuclear plant the source of heat is a nuclear reactor. Although the basic process is simple, making it work is rather complicated. First, let’s look at the process of how nuclear fuel produces heat. The fuel for a nuclear reactor is uranium, but not just any uranium. Most uranium atoms (99.3%) have a nucleus with 146 uncharged neutrons and 92 positively charged protons, for a total of 238 neutrons and protons. We call this number the mass number, and refer to these atoms as uranium-238, or just U-238. However, not all uranium atoms have 146 neutrons; 0.7% have 143, and these are called U-235. Even though both U-238 and U-235 are uranium, they have different characteristics. The most important difference is that U-235 spontaneously splits, or fissions, producing two smaller nuclei (called fission products) plus two to five neutrons. The fission products and the neutrons have energy, which is the source of heat. To have U-235 fission efficiently, the uranium fuel in a reactor is enriched; the uranium goes through a process to increase the content of U-235 from 0.7% to 3 to 4%. One aspect of the fission products, which was a major factor in the TMI accident, is that the fission products are radioactive. A radioactive nucleus changes (decays) to another nucleus by emitting a particle; for fission products, this is a beta particle, which is just a high speed electron. In addition, when a fission product decays, the nucleus emits one or more gamma rays. Collectively, the beta particle and gamma rays are called radiation and this radiation has energy. Because the radiation has energy, it is also a source of heat in a nuclear reactor. In fact, radioactive decay of fission products produces about 7% of the heat in a nuclear reactor that has been operating for several months. The rate of U-235 spontaneous fission is very slow, too slow to be of any use in a nuclear reactor. However, U-235 can fission if a neutron hits it. Therefore, if a single U-235 nucleus fissions, the emitted neutrons can induce a fission in two or more U-235 nuclei, which each in turn can produce two or more, etc. If enough U-235 nuclei are close together, the process can accelerate, producing a lot of energy in a short time. This is the basics behind a nuclear weapon. However, to produce a large explosion, the uranium needs to be enriched to more than 50 percent U-235. 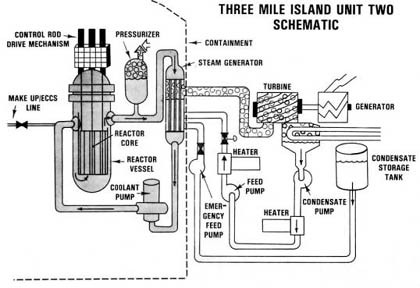 Because the fuel in a reactor is only three to four percent U-235, the reactor cannot explode like a nuclear bomb. Ideally, the fission process in a reactor should reach a constant rate so the reactor can maintain a constant high temperature. To maintain the desired temperature, the rate of fission must be constant. However, each fission produces several neutrons, so only one of these neutrons should induce one fission; no more, no less. To maintain this constant rate of fission, the reactor must have some mechanism to absorb the other neutrons before they hit another U-235 nucleus. In a reactor, this absorbing material is in the control rods. Fully inserting the control rods into a reactor will cause the fission process to come to a complete stop. By varying the level of the control rods, the operators can set any desired rate of energy production. Thus, the control rods act as a “gas pedal” for the reactor; inserting them slows the fission process, and removing them allows the fission process to accelerate. Now, how does all the heat generated in the reactor become electricity? Refer to the TMI Unit Two schematic for the following discussion. An animated description can be found at the Nuclear Regulatory Web Site: http://www.nrc.gov/reactors.html. The reactor vessel contains the core (i.e., the uranium fuel) and water. 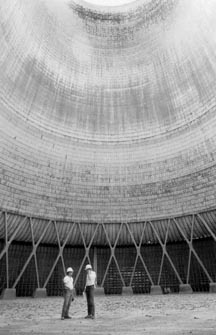 The reactor at TMI is a Pressure Water Reactor (PWR) which means that the water in the reactor vessel is under high pressure (about 2,000 pounds per square inch (psi)) and high temperature (about 600äF). At this temperature and pressure, water does not boil, so the reactor is completely filled with water. Because water is not compressible, maintaining a desired pressure is difficult if the entire system is solid water. Therefore, a pressurizer in the system contains a mixture of air and steam. By adding or removing air, the operators can maintain the desired pressure. The pressurizer has a valve that automatically opens in an emergency if the pressure gets too high. This is the valve that malfunctioned during the accident and was the cause of the accident. The heated water in the reactor flows to a steam generator (actually the system has two steam generators; the other one is not shown). This is just a large tank with pipes flowing through it. 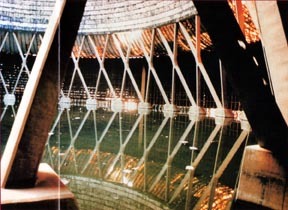 The water from the reactor flows through these pipes; these pipes are surrounded by water in the tank. The water in the tank is at a lower pressure, so when the water from the reactor flows through the pipes, it heats the tank water close to 600äF, but at this lower pressure, this water boils, forming steam. 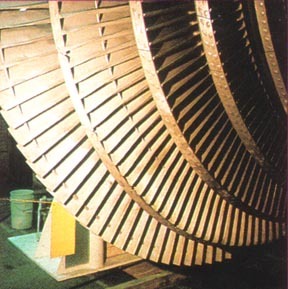 The steam goes to the turbine causing it to rotate which then turns a generator, thus producing electricity. On the exit side of the turbine is a condenser. To get the maximum energy out of the steam, the second law of thermodynamics requires that the entering and exiting steam have a maximum temperature difference. This condenser cools the steam (by contact with external piping) and sends it to the environment. In some cases the environment is the water of a lake or river. At the TMI plant, this waste heat is sent to the atmosphere via cooling towers (not shown in the schematic). 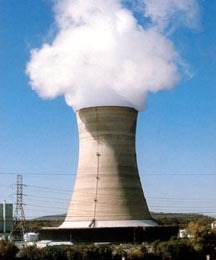 Therefore, the water vapor from the cooling towers is just that, water vapor; it does not contain any radioactivity. Note that a PWR contains three separate water loops: the first is the water in the reactor that moves heat from the reactor to the steam generator, the second is the turbine water that moves the heat from the steam generator to the turbine, and the third loop is the condenser water which moves heat from the turbine to the environment. Nuclear plants are about 35 to 40% efficient; i.e., 35 to 40% of the heat generated in the reactor ends up as electricity; the rest goes to the environment. Most fossil fuel plants are 40 to 45% efficient. The condensate pump sends the water from the turbine back to the steam generator where it is heated again. Ideally, the water in all three loops should not contain radioactivity. The uranium fuel is clad in zirconium cylinders (called fuel pellets – about the size of the end of a little finger) that should not leak. However, some pellets do leak and fission products escape into the reactor water loop. 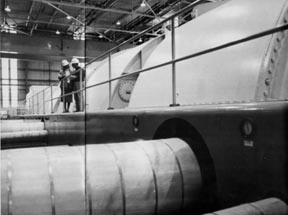 To prevent further leakage via water leaks, the plant has a purification system that constantly removes most of the radioactivity in the reactor water. Before we discuss the accident in the next section, note the pumps in the different systems. Each played an important part in the accident. The coolant pump keeps the water circulating in the reactor to keep that cool. The feed pump keeps the water circulating in the turbine system, which is critical for removing heat from the reactor water. The emergency feed pump is a back-up to the feed pump when that pump fails.